April | 2014 | I'm Skinny, Now What? Go ahead and fill your cart up with the good stuff. One of the biggest lessons I had to learn on my weight-loss journey was how to grocery shop. Sure, I’d spent what felt like hours at the store with my mother as a kid, like we all did. I went up and down the aisles looking for cookies and crackers while she spent what felt like an eternity in the produce section looking for the perfect bunch of greens and fruit. Before I began this journey, I shopped with the mindset of most post-undergrads: What’s the easiest thing to heat up? How can I get out of here quickly? It wasn’t that I didn’t know how to cook, I just didn’t want to. I knew the easy staples: spaghetti, chili, fried chicken, macaroni and cheese. I could even hook up a lasagna if the mood hit me. Taking a bigger interest in my health required me to take an even bigger interest in what I was putting into my body. I was never a calorie counter. It just made eating depressing. Who wants to think about how many calories are in a spicy chicken sandwich from Wendy’s (510, by the way)? I started off with fresh vegetables. I was the kid adults never had a problem with eating her veggies. It was no biggie as an adult. I had to give up putting cheese on my steamed broccoli, but that wasn’t so bad. Shopping for fresh vegetables was too scary for me, so I began with the frozen food section. It’s easy to heat up and you don’t have to worry about picking what’s right. The problem is that frozen veggies left in the freezer too long taste horrible when cooked. I liken it to frozen metal. Do you want to eat this? I had to learned how to pick out fresh vegetables like asparagus, Brussels sprouts and green beans. I started steaming, sauteeing and even roasting. Spritz a little lemon juice on them, and they’re quite tasty. Who knew? Finding fresh veggies is going to be one of the hardest things you do at the grocery store. But here are some tips that can make everything else a little easier on you. Try something new. Planning your meals for the week can be fun, especially if you’re trying something new. Look in your cookbook and see if there’s some new way to bake your chicken. Look for something that uses an ingredient you’ve never tried before. Who knows? You may see something else in the aisle that tickles your fancy. Have an exit strategy. A grocery store can seem like a carnival (especially Saturday at Trader Joe’s). There are always samples out. You’re going to have to walk past the ice cream to get to the frozen vegetables. The universe dictates that your favorite snack go on sale at five for $5 the day you decide to go into beast mode. The best way to avoid these temptations is have a plan of escape. Cross everything off your list as you go. Allow yourself a couple extra items that weren’t on your list, but limit yourself to just a couple. And try to avoid checkout aisle snacks. Sure, a Kind bar isn’t so bad. But it’s sitting right next to the Hershey Almond bar. What would you choose? How do you prepare for grocery shopping? And what’s your go-to item at the store? These were spread all over my house while I was sick. I’ve come to the conclusion that I’m like a toddler. In addition to an inability to handle hunger and sleep deprivation well, I also am a nightmare when I’m sick. There’s no easier way to say this: I’m mean. I lose all patience for other people and their problems when I have my first sniffle. It’s just another personality quirk that I think others need to deal with. When I returned from sunny, warm Rio to cloudy, cold New York, I had a jacked-up head cold. From the time I got off the plane, I was sneezing and coughing. My boss told me that I sound like his children when they’re stuffed up, words that did nothing to boost my ego (or my immune system). I could handle being sick because I’ve been taking care of myself for a long time. What pissed me off, though, was how this case of sniffles impeded my workout plan. Before I lost the battle of the sniffles, I had gone the gym twice that week. The first time, I couldn’t make it 30 minutes without shutting it down. My second wind swooped in for my second visit, allowing me a full hour of cardio and in a few crunches. That was the calm before the storm, though, as the next day had me struggling to breathe through my nose. My plans to shed the Brazil pounds had to be put on hold. The one-two punch of diet and exercise was going to have to wait. With exercise on the back burner, I’d have to focus on diet while trying to clear the gunk out of my face. One of the best lessons I learned during my weight-loss journey was the need for preparation. Having a stocked cabinet and freezer often kept me from stopping by Wendy’s on my way home. Why spend on a spicy chicken sandwich when I had chicken breasts and hot sauce at home? 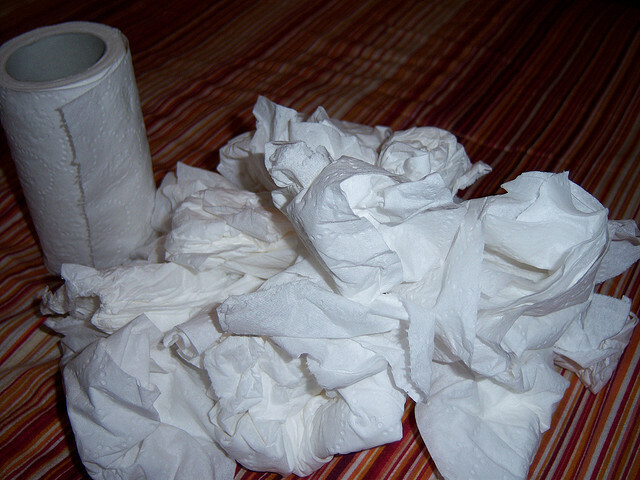 That lesson came in handy as the tissues piled up around me. I’d gone to the grocery store soon after my return, so I had a plenty of good things to cook. One of the first things I made was chicken noodle soup. Instead of doing a separate recipe post, I’ll give you the basics: cook the chicken, boil some broth, add noodles and frozen veggies. Ta-da! It’s easier to take care of yourself when you’ve prepared ahead of time. Having a few go-to recipes in your stable can make or break you sometimes while on this journey, especially when your body is telling you to shut it down. What do you do on your sick days that can allow you to stay on track?